This past weekend I had a few friends over for dinner. It was a last minute sort of thing, which, in my opinion often turns out to be the most fun. I found these tiny potted herbs at Trader Joe's that morning and could not resist them. Later on, when we decided to get together for dinner I thought that they would make nice place card holders for the table. I stamped each person's name on card stock in gold and then trimmed the edges with scalloped scissors. I then decided that I wanted to make some nice napkins for the evening. A while ago I found this beautiful linen from Italy. It is a flax color with a fine weave. I love the way it looks when it is right out of the dryer. I made napkins with a small raw edged ruffle around the perimeter. I really like the look that the ruffle has been torn. The downside is that you do have to clip some strings after washing. If you look closely you can see the the edges are a shade lighter that the rest of the fabric. I like that effect as well. The best part of the evening, of course, was the company. I remind myself often how blessed I am to be surrounded by wonderful friends and family. 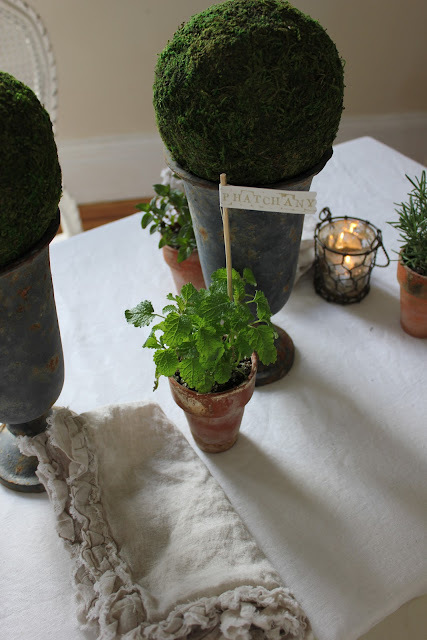 What a cute idea to use herbs for your place card holders! It's always fun to make something unexpected for your guests. I'm sure your evening was fun. Michele your table looks gorgeous and those place card holders are so creative! Oh my goodness those little herb pots are so cute and you made them even cuter with your darling banners! What a sweet touch for your friends. I adore your napkins, they are gorgeous! Michele, your details for your dinner look so awesome. I bet the fresh herbs on the table smelled amazing. Also your mind-set about the blessing of friends is so wonderful. Friends - true friends ARE a real blessing to be sure. I kist love hearing other peeps entertain, we do it - especially I do it - so often and rarely ever does anyone else I know, unless it is potluck bring your own. I am happy to know your last minute dinner was a success. I think we need to just DO IT and worry less about the details - it is the getting together part that is so very very important! How cute!! Love the herbs and the napkins you used. I bet it was a great evening, thanks for sharing. the potted herbs are so cute and i LOVE the napkins you made!! Love everything. The little potted plants are so sweet and LOVE your mad sewing skills. Those are darling and your setup is even more so! I'm in love with your rough edges! Some of them are on my wish list! 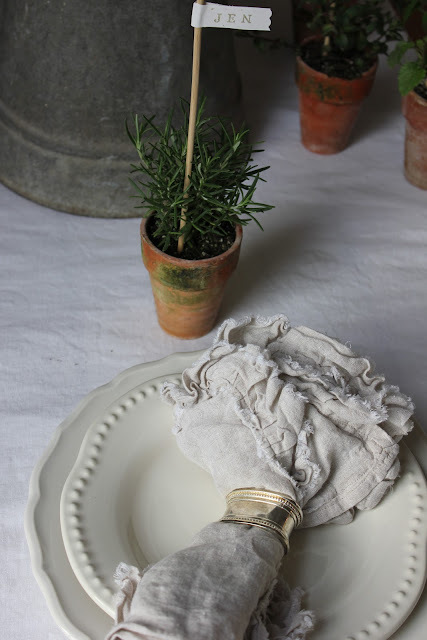 I am going to daydream about that Italian linen today! What a darling setting you created in the spur of the moment. I love love the linen napkins, and the sweet little potted herbs. I'm sure it was such a treat to sit down to a table with those natural elements. I think the unplanned things often turn out to be the most fun too!